Public space has long been an important part of artistic discourse, existing both on the fringe and in more accepted contemporary examples. One art collective has managed to combine a focus on public space with a passion for athleticism and a D.I.Y. sensibility. Meet the New Craft Artists in Action. The New Craft Artists in Action (NCAA) is a “craftivist” collective that addresses public space, diversity, collaboration, feminism, and interdisciplinary learning through its “Net Works” project. 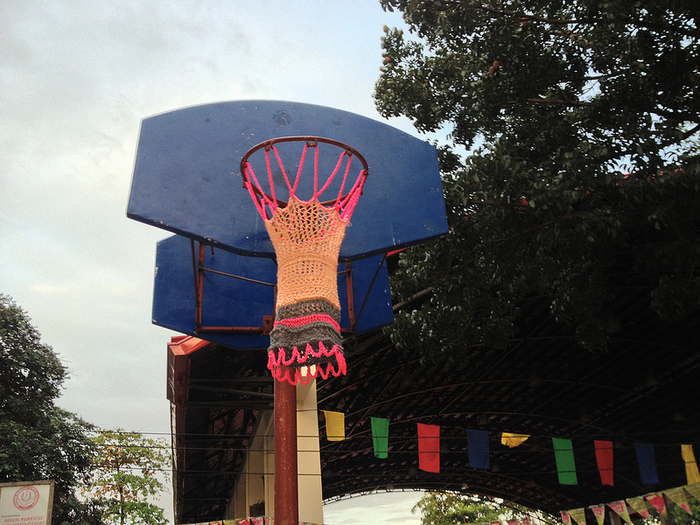 “Net Works” is a collaborative, educational project that promotes the creation of hand-crocheted or hand-knit basketball hoops and their installation in public spaces. 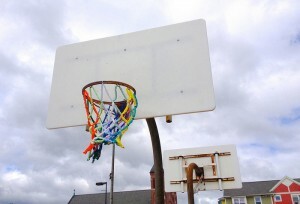 “The collective assembles handmade basketball nets for abandoned hoops to build proactive inclusive relationships between artists, athletes, and neighbors,” according to its Tumblr. Maria Molteni, NCAA team leader, brings her passion for both the physical gratification found in basketball and her love of crafting to the project, now more than three years in the making. According to its history, the NCAA “was born out of Boston, Massachusetts, longitudinally central between Springfield’s Basketball Hall of Fame and Lowell’s American Textile History Museum.” What began in Boston as a humble public arts initiative has gained an international reach, and since its founding in 2010, “Net Works” has reached as far as Detroit, Pittsburg, LA, Toronto, Flint, San Francisco, San Antonio, Hungary, South Africa, and the Philippines. The NCAA is committed to changing the way that people interact with their environment (namely in public basketball courts), and in bringing color, crafts, and fun to places where it is lacking. In mid-December, the NCAA experienced a massive victory when its “Net Works” Kickstarter Campaign got fully funded. The campaign was created to raise funds that would go towards the creation and distribution of an instructional book, based off of the original “Net Works” project. This instructional resource contains art, prose, featured artists, information about the “Net Works” project, and accessible tutorials on how to make basketball nets for your own community. Through this instructional book, the NCAA can reach even more places, and inspire even more people to get excited about basketball and crafting. Learn more about the NCAA and see its basketball nets from all over the world by visiting the collective’s “Hall of Nets”.